Pittsburgh Family Law Services, P.C. | Pittsburgh Family Law Services, P.C. Posts By Pittsburgh Family Law Services, P.C. When you are ready to turn the page, protect your rights and your future with experienced family law advocacy, we can give you the help you need to face family law challenges in Southwestern Pennsylvania. Call our Pittsburgh, Pennsylvania office for a free telephone consultation at 412-371-4500. Pennsylvania child custody law is changing: can grandparents and non-parents still file? May 11, 2018 · by Pittsburgh Family Law Services, P.C. “Remember that children, marriages, and flower gardens reflect the kind of care they get.” – H. Jackson Brown, Jr. The most fortunate children grow up being loved by many adults besides their parents, but loving a child cannot by itself confer the right to claim custody of that child in Pennsylvania. Only people who have “standing” under the law may ask a Pennsylvania family court to grant them an award of custody. On May 4, 2018 Pennsylvania Governor Tom Wolf signed into law Senate Bill 844, which makes some major changes to who can petition a PA family court for child custody. It affects grandparents’ rights to ask for custody of their grandchildren; and under certain circumstances, it grants standing for the very first time to third-parties such as aunts, uncles and other close relatives to sue for custody. The new law takes effect on July 3, 2018, sixty days after being adopted. What is “standing” in a Pennsylvania child custody case? Standing, for purposes of the law, has to do with who has the right to make a claim before the court, and to have that claim heard. Going to court in Pennsylvania was never meant to be a free-for-all; you must have a reasonable basis to ask for what you want the court to grant. If you are a parent, you always have standing to request a PA court to determine your custody rights toward your own children… but probably not to ask that same court to make decisions about my children. Having standing to file for custody of kids does not mean that you will win, of course. It just means that you have the right to make the request. You still will have to back up your claim according to the standards set under PA child custody law, and to convince a judge that the custody arrangement you want to establish is the right outcome. No matter how much you love a child nor how committed you may be to that child’s well-being, the courtroom door will be closed and barred against you if you lack standing to make the claim. Who can sue for any form of physical and legal custody of a child in Pennsylvania? Pennsylvania child custody law makes a distinction between physical custody (the right to obtain the physical presence of a child) and legal custody (the right to participate in the parental decision-making process over that child). Likewise, there is a difference between the kind of standing that will let the claimant ask for any form of physical or legal custody over a child, and the kind that sets a lower standard, and that is limited to claims for partial physical custody or supervised partial physical custody. Parents. That’s no surprise. If you are a child’s parent whose parental rights have not been terminated by a court (for example, by adoption), you can make your claim and be heard. A person who stands in loco parentis to the child. “In loco parentis” standing applies to an adult who is not a parent to a particular child either by blood or by adoption, but whose relationship with the child was begun by a blood (or adoptive) parent in anticipation that it would become indistinguishable from a parental relationship. In practice, this means that the child has resided with the adult who claims in loco parentis standing Step-parents often can claim this kind of relationship, as can grandparents who have, in effect, become parents to their grandchildren due to the absence, incapacity or disinterest of the actual parents. Grandparents not in loco parentis, who meet a strict and narrow standard. To meet the standard, the claimant must be a natural grandparent to the child (step-grandparents don’t make the cut), and the relationship with the child must have begun with the consent of a parent (or by court order). The grandparent must have assumed, or be willing to assume, responsibility for the child. Additionally, one of three things must be true: (1) the child must have been found “dependent” by a juvenile court; (2) the child is substantially at risk due to parental abuse, neglect, drug or alcohol abuse, or incapacity; (3) less than six months before the grandparent files the custody claim, the child had been living with that grandparent for at least twelve consecutive months before the child was removed from the home by a parent. 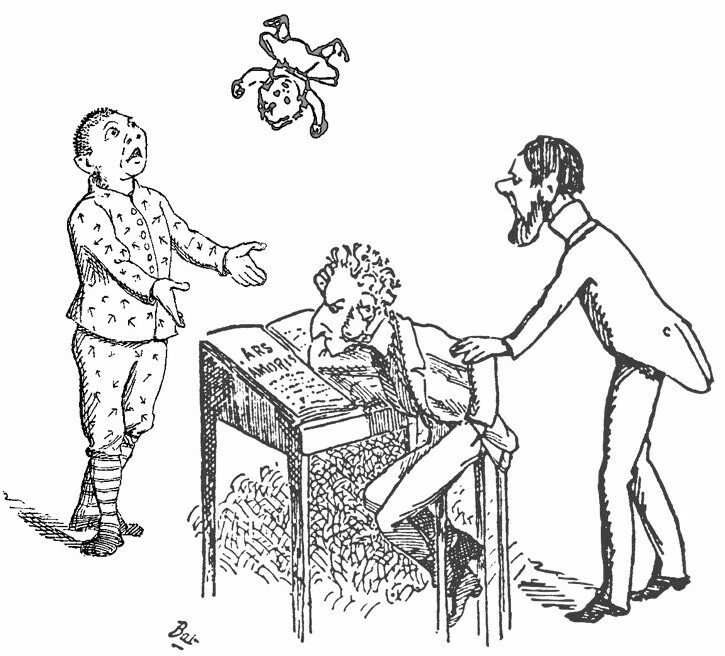 Any person who is able to establish by clear and convincing evidence: (1) that he or she has assumed or is willing to assume responsibility for the child; (2) that he or she has a sustained, substantial and sincere interest in the child’s welfare ; and (3) neither parent has any form of care and control of the child. The person who meets this standard need not be a grandparent, or even a blood relative. Please note that this category does not apply where there is a current dependency proceeding involving the child, or where the child has been adjudicated dependent and the court has made an award of permanent legal custody. Who can sue for partial physical custody of a child in Pennsylvania? The parent of a deceased parent. Grandparents can claim access to a grandchild if their own child, a parent to their grandchild, has died. A grandparent with whom the child has resided for at least a full twelve months, if the grandparent files the custody claim within six months after the child was removed from the grandparent’s home by a parent. A grandparent whose relationship with the child began either by a parent’s consent or by court order, when the parents have commenced a custody proceeding and when the parents cannot agree over whether the grandparent should have custody. Who lost standing when the law changed? Grandparents are no longer able to file for partial physical custody simply because the parents of their grandchild have been separated for six months or longer, or because the parents are parties to a divorce proceeding. If you need legal assistance with your grandparents’ rights case or otherwise protecting children you are caring for, call our office to set up a personal consultation with a Pittsburgh child custody law attorney. Please do not comment anonymously, and do not post anything that you consider confidential. We try to be responsive to commentary and questions, but know that posting here will not create an attorney/client relationship and that we will not offer legal advice via the Internet. October 6, 2016 · by Pittsburgh Family Law Services, P.C. 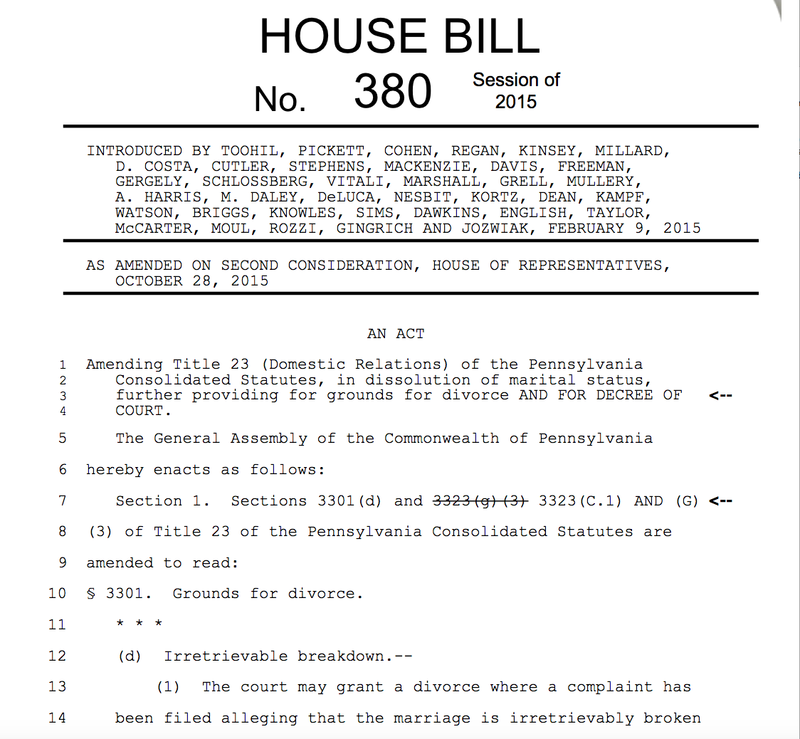 On October 4, 2016 Pennsylvania Governor Tom Wolf signed into law House Bill 380 of 2015, which reduced the waiting period for an “Irretrievable Breakdown” no-fault divorce ground from two years after the spouses separate, to only one. The change took effect on December 5, 2016. 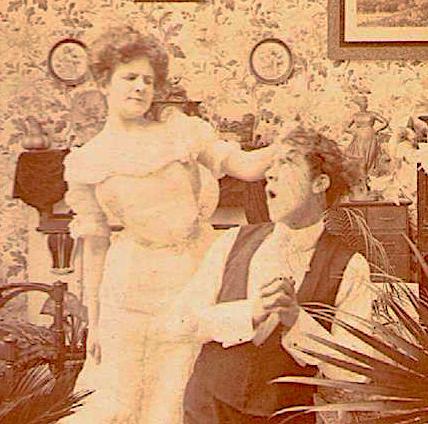 The way we were: two year separation before divorce in PA.
Pennsylvania has two “no-fault” divorce grounds: Mutual Consent, and Irretrievable Breakdown. Mutual Consent requires no particular length of separation, but does require the active cooperation of the spouses, and either spouse can bring the divorce process to a screeching halt simply by refusing to sign the divorce consent forms. If there is no mutual consent, grounds for divorce of Mutual Consent simply cannot be established, that remains true even after Pennsylvania’s divorce law change goes into effect. “New wave divorce” in Pennsylvania: the two-year wait gets cut in half. 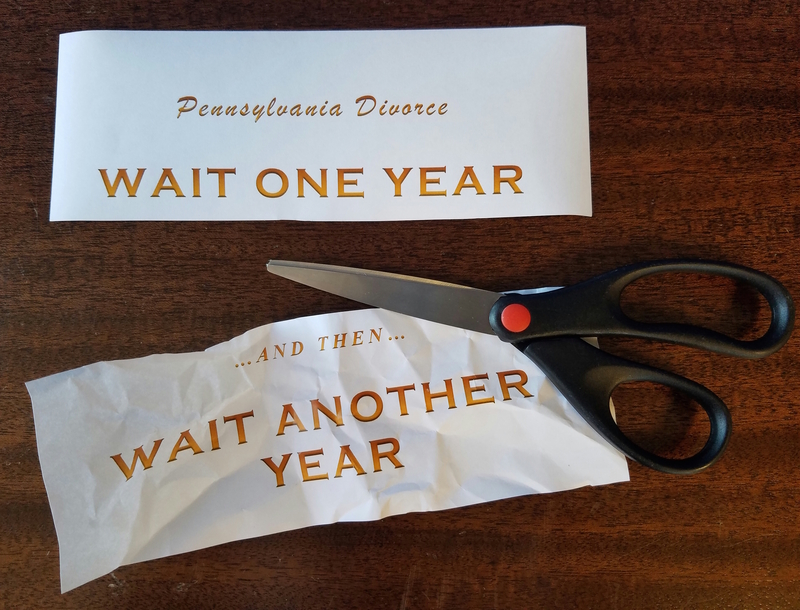 For married couples in Pennsylvania who separated on or after December 5, 2016, the Irretrievable Breakdown ground for divorce will require only one year of living separate and apart for one spouse to be able to proceed toward a divorce decree without the other spouse’s consent. It is not an exaggeration to say that this is a major game-changer. How will the change in Pennsylvania law affect my divorce? Imagine that you live in PA and are married-but-separated, and that you are economically dependent upon your spouse (which might be your exact situation). You might already know that Pennsylvania law allows you to file for spousal support without also having to file a claim against your spouse for divorce. Once you have been to court and your spouse is required to pay support money to you each month, you are effectively being paid to do nothing at all when it comes to cooperating with a divorce process. What do you do next? In most cases you do what you are being paid to do, of course: nothing… nothing at all. Your spouse can go ahead and file for divorce, but you have no obligation to sign the consent forms that would let the divorce process move forward under Mutual Consent. Unless you have a compelling reason to file for divorce yourself (and sometimes those reasons exist), if you are like most people you will end up stretching your advantage until your spouse can move things forward anyway under the Irretrievable Breakdown ground. The change to Pennsylvania divorce law chops a full twelve months off of that free ride. For people stuck paying spousal support month after month, the reduced waiting period might well be cause for celebration. If on the other hand you are a Pennsylvania spouse who receives support, you now will have a much smaller window of time to get your finances and your life together and to decide “what you want to be when you grow up,” before you can be compelled to participate actively in in the process of working your way toward full economic closure for your marriage (possibly including alimony and marital property division). Since the most successful alimony claims tend to involve a clear plan for improving your economic situation, an economically-dependent spouse’s window of opportunity is now massively reduced. The same procrastination that would have been your best friend under the old law may now be toxic to the strength of your case. This change makes it more important than ever before to talk to a local Pennsylvania divorce lawyer sooner rather than later. There is opportunity as well as challenge in every situation, no matter how difficult, and your best chance to take advantage of it only happens if you are willing to be proactive. Where divorce and family law are concerned, an ounce of prevention really can be worth a pound of cure. If you are in Southwestern Pennsylvania, call our Pittsburgh divorce and family law office for your free consultation by telephone. How long will my divorce take, if we both want it? How long will my divorce take, if my spouse won’t agree? If you need legal assistance with your divorce or family law matter in Southwestern Pennsylvania, call our office to set up a personal consultation with an experienced Pittsburgh divorce lawyer. Please do not comment anonymously, and do not post anything that you consider confidential. We try to be responsive to commentary and questions, but know that posting here will not create an attorney/client relationship and that we will not offer legal advice via the Internet. June 16, 2016 · by Pittsburgh Family Law Services, P.C. Once upon a time, a group of people from a mighty civilization found themselves united in spirit by a shared compassion over the plight of those who were less fortunate than themselves. Knowing well that most things only change when somebody changes them, they resolved to travel together to a faraway farming village – the first of many, they hoped – to educate the people there in modern agricultural methods that would certainly improve their lives. They made their plans, gathered their supplies and their courage, and set off. Along their travel they often discussed eagerly the grand welcome they would receive upon arriving, and the celebration of a grateful community after the first fruits of their mighty gift became ripe for the harvest. Some of the travelers felt deeply insulted to hear their intentions turned against them. “We came here to do good,” they said among themselves, “but these ungrateful dirt-scratchers are no smarter than their cattle. They live one failed harvest away from watching their own children starve, and yet they spurn the gift we traveled so far to give! And they call us fools? Let us go where people are wise enough to know treasure when they see it, and leave these peasants to eat their arrogance and effrontery when nothing else is left for them to put between their teeth.” Those who felt that way soon departed to nurse their wounded pride, and whatever may have become of them after that is no concern of ours. The travelers who chose to remain and try again gave sad farewell to their disheartened brethren, and then gathered together in council to think and speak upon the mystery of a good gift casually spurned. The discussion went long into the night, but finally they thought they understood. “Even the purest water slakes no thirst if none will trust that it is good,” they decided, “and people prefer to lift cups to their own lips.” Thus resolved, when morning came they made their plans. The travelers moved their belongings to the land that was now theirs to work, and for several months they and the villagers left each other quite alone. That was just fine with the villagers; a good joke was welcome now and again, but there was always work to be done: crops and children to raise, cattle and children to feed, and pots and children to shape and harden to readiness for the tasks awaiting them. The days came and went as always, until after several months the strangers returned to seek out the elders and to invite the whole village to gather at the next full moon for the promised feast. The appointed night came amidst much gossip and speculation, and the curious villagers flocked to the appointed gathering place to discover an astonishing bounty waiting for them. Here were the largest fruits they had ever seen, nearly free from blemish and sweet as a baby’s laughter. Here were roasted vegetables in seemingly endless quantity, their savory odors perfuming the air. Here was fresh bread, with a flavor at once unfamiliar and enticing. Here was oiled meat spiced with herbs. There was food enough to feed half again the number of people who dwelled in that place. Amidst surprised laughter and excited chatter, the feasting began. “You ask me to risk my life, for five! How could I do such a thing for less than ten? Two weeks later, the travelers on their borrowed farm finished their labors for the day and gathered at sunset for the evening meal. Toasts and merry songs added uncommon spice to their dining on that very special occasion, and the merriment continued until long after the stars began their bright dance through the moonless sky. Outside the noisy hall in a line along the fence, seven mules waited patiently in the darkness to carry their burdens of seeds, tools and diagrams to seven secret meetings. If you need legal assistance with your divorce or family law matter in Southwestern Pennsylvania, call my office to set up a personal consultation with a Pittsburgh family court attorney. Please do not comment anonymously, and do not post anything that you consider confidential. We try to be responsive to commentary and questions, but know that posting here will not create an attorney/client relationship and that we will not offer legal advice via the Internet. April 5, 2015 · by Pittsburgh Family Law Services, P.C. “Hey, that was fun! Can I do it again?” — No witness, ever. I have to testify at a hearing in family court. What now? It was bound to happen, sooner or later. Your family law attorney has filed papers and negotiated for you while you got on with the business of living day to day, but now it’s time to squeeze more time off from work because the court is ready to hear directly from YOU about what is actually going on. No Pennsylvania family court can make decisions about disputed issues of fact – who did what, what happened when, who might or might not be telling the truth – without holding a hearing or a trial at which you and your ex each have the chance to speak, to introduce documents into evidence, and to call any additional witnesses that might help the court to do its job. Whether you are going to court to deal with child support, child custody, divorce or another family law dispute, the court is finally ready to hear what you have to say. Take a deep breath, and keep your hands and feet inside the ride at all times. What should I expect when my case goes to hearing? Formalized structure. A hearing or a trial is a formal process intended to give you and your ex a full opportunity to present your sides of the case to a family court judge (or hearing officer, special master, etc.) who is giving each of you his undivided attention. Remember that although you have been living your case day in and day out for months or even years, your judge might have only the most limited knowledge of the situation that he has been asked to referee. Your hearing will be structured in a way that is designed to give the judge all the information he needs to be able to understand the situation (while avoiding the distraction of unnecessary information), to know exactly where each of you is coming from, and to be able to make a fair and informed decision. Limited scope. Your hearing is happening so that the court can resolve a very specific set of issues and questions, and for no other purpose. Imagine being in a supermarket where the only items you can put in your cart are the ones on your shopping list. It has to be this way because both you and your ex have a Constitutional right to due process, and part of that due process is having a clear understanding of the issues to be addressed on the day you step into the courthouse. This way, everyone can be fully prepared and nobody gets blindsided. The judge does not share your perspective. Even if your family court judge is ultimately inclined to find in your favor, he will almost certainly not see your situation in the same way you do; in fact, it is almost certain that he will not see things through your eyes, or (for that matter) through the eyes of your ex. His perspective, his goals and his priorities might be entirely different from yours. Your family law attorney should be reviewing your case with you in advance of your court appearance so that you have as clear an idea as possible of how your case will look through the eyes of the judge, what you are getting into, and what you might be able to expect. In the end, your judge is the only person in the entire situation whose opinion matters, because he has the power to tell both you and your ex how things are going to be. Your job is simple. Your lawyer will have structured your side’s presentation in a way calculated best to educate the judge on the facts he needs to know to be able to find in your favor. Here is some good news: any experienced family lawyer in Pennsylvania will do all of the heavy lifting of preparing for trial, to make your experience of being on the witness stand much easier than you might think. What should I do before I go to court for my hearing? Make sure your lawyer knows the “bad stuff” as well as the good. Your lawyer wasn’t behind your closed doors any more than was the judge, and knows only what you have told him and what he was able to learn. As a Pittsburgh family law attorney, I need to know everything about your case and not just the facts that make my own client look good. Nobody walks into a courtroom with a perfect case, and it is always better for your lawyer to learn the weaknesses of your case across a desk rather than across the courtroom; that will let your attorney take everything into account when structuring his presentation. It can be very, very hard to tell your lawyer about choices and actions that don’t belong on the list of your finest moments, but sometimes your willingness to do so can make all the difference. Follow your lawyer’s advice. Your lawyer may have given you information and suggestions to help both of you prepare for trial, such as organizing information and documents, and providing them to him early enough to incorporate them into his presentation. Life has plenty of distractions and sudden priorities, and it is dangerously easy to put off that kind of preparation until days turn into weeks, and time runs out. Make preparation a priority. You will not only make your lawyer more effective on your behalf, you’ll probably save yourself some legal fees by doing it; the more organized you are, the less organized you need to pay your lawyer to become. Make double-sure that the information you give lawyer is complete and accurate! I once had a client who was suing his ex to modify his child support obligation, but who was too busy to get me current pay stubs. He assured me, though, that as a salaried employee his income had changed not at all after the most recent documentation I had. At the hearing I told the court what he had told me, he agreed under oath that the information I provided on his behalf was correct, and everything was going just fine right up to the point where his ex’s lawyer asked him, “Have you received any bonus income after the date of these pay stubs?” “Yes,” he said. Surprise! He had received an annual bonus of almost $40,000 that I knew nothing about. After that, the hearing officer was less inclined to believe my client about anything he said. He may never have intended to mislead the court – he didn’t lie about the bonus when opposing counsel happened to ask the right question – but his choices hurt him all the same. Don’t decide what your lawyer needs to know; instead, give your lawyer everything and let him decide. Get your lawyer any necessary documents as early as possible. If an important document isn’t in the courtroom at the time of the hearing, it may as well not exist. I cannot tell you how many witnesses I have interviewed over the years, who answered my question about whether they had evidence to back up their claims with something like, “I’ve got plenty of proof at home. I can show it to you anytime you like.” Any time except right now, that is. Don’t count on “do overs.” Either you have what you need when you need it, or you do without it. Prepare. Your lawyer should review your testimony with you in advance, to minimize surprises for both of you. You should take the time to review, with your lawyer or alone, the documents that will be presented into evidence on your behalf, and the facts that the court will need to know to be able to find in your favor. If you are going to court for a child custody case, make sure that you can speak knowledgeably about the “basics” such as each child’s educational history and medical needs. If you will be at a trial for equitable distribution of marital property, review and update yourself about the marital estate and its value. Your lawyer can help you direct and focus your efforts for maximum benefit, so that necessary information is fresh in your mind when you sit in the witness chair. You don’t have to memorize anything, but refreshing your memory in advance is never a bad thing. Get enough sleep the night before. This may be too much to ask, but try anyway. Your stress level is probably high enough, as it is. Do yourself a favor and get some rest. Dress well. Leave your ripped jeans and your “Only God can judge me” T-shirt at home. A neat appearance matters, in that it shows respect for the court. I usually tell my clients, “dress for the office.” Men, you don’t have to wear a suit and tie (not that it hurts), but a collared shirt is certainly a plus. Ladies, wear something with sleeves that isn’t skin-tight. Make sure your telephone will not ring, buzz, chirp or sing. Don’t make the judge angry. You wouldn’t like him when he’s angry. What do I have to worry about at my hearing? Mostly, you need to worry about yourself. Your lawyer is there to take care of the rest, and by the time you reach the courtroom he will have given you a good idea about what to expect. When you are not testifying you are quiet, respectful and attentive. When you are testifying you are calm, candid and sincere. You will find your worst enemy in any mirror. You are angry, frustrated or nervous, or – more likely – some combination of all three. I remember one client of mine who just would not sit still or stay quiet in court. As she listened to her former husband’s testimony and knew he was lying, she offered a continuous stream of gasps, tongue-clicking and facial expressions of wide-eyed disbelief. My efforts to calm and quiet her made no impact until the judge turned our way and shouted, “Can the cheap theatrics!” This is not the kind of attention you want from your judge. Assume that your judge has a working brain. One of the hardest-won skills of any lawyer handling divorce and other family law matters is to know when to shut up and leave the rest to the judge. When I served on arbitration panels for civil cases many years ago, there were times when I wanted to reach across the table to grab a lawyer by his tie, haul him close, and say, “I got your point five minutes ago. Why don’t you pretend that I have a brain, and move on?” I practiced before an Allegheny County hearing officer on many occasions who must have had the smartest pet in the world, because whenever I tried to belabor a point in front of her she would say, “My cat knows that.” Sometimes, more is better; at other times, more is just… more. The judge doesn’t need to know everything about everything. In Pennsylvania family law cases, there is usually no “magic bullet” that will determine the outcome of a case. Usually, the judge will form opinions based on the accumulated weight of evidence, and in court you always lead with your strongest arguments, and might not even need the rest. This means that you will probably leave the courtroom with any number of things left unsaid, wondering whether any one of them might have made a difference; but the answer is usually, “no.” I usually compare giving evidence in a courtroom to filling a bucket with water; there comes a point at which either the bucket is full, or you realize that the bucket can never be filled because there is a hole in it. Either way, you stop pouring at that point if you don’t want to make a mess. The “moving party” will usually go first. The “moving party” is the one who made the request that led to the hearing being scheduled. This person is also sometimes called the “movant” or the “petitioner,” and the other party is the “respondent.” Generally, the moving party will present his or her case completely (including all witnesses and all documentary exhibits) before it will be the respondent’s turn. Direct examination is more friendly than cross-examination. When you are called to testify, your lawyer will have questions for you to answer; this is called “direct examination.” In some court systems such as in Allegheny County, part direct examination might also be presented by your lawyer in the form of a summary. Direct examination is very open-ended, with questions that call for narrative responses. When that is done, your ex’s lawyer will be able to ask you questions on cross-examination, many of which will be highly leading, and which are intended to bring out weaknesses in your case and other “bad stuff.” If your lawyer considers it necessary, he can ask you additional questions afterward (called “redirect examination”) to give you an opportunity to flesh out or to explain some of the answers you gave during cross-examination. Take a breath, take a moment. Remember those words, say them to yourself when the experience starts to overwhelm you; they might just help you get you through it. When you arrive at family court for your trial. You’re in the spotlight right away. Consider how you size someone up, the moment you meet him. This person may not have said a word to you, yet, but already you’re making decisions about whether he can be trusted, whether his motives are genuine, and whether you can relax around him. We communicate in all sorts of ways, besides speech: posture, facial expression, body movements, and more. Even when it is not your turn to speak, you are “on camera” as long as you are in the judge’s field of vision, and despite the judge’s experience and responsibilities he is as human as you are. Count on this, and give the judge what he wants to see: respectful attentiveness and a clear understanding of what you learned back in elementary school: don’t speak when it is not your turn. Be calm and focused. You don’t have to be made of stone, and you don’t have to pretend that you have no emotions, but it is the rare judge whom you will impress with your passion, rather than with your willingness to be reasonable under difficult personal circumstances. The judge already knows that you’re not having your best day. Best days are seldom had in courtrooms! Forget every courtroom drama you ever saw. Your hearing will be an orderly process of fact-finding, and you can count on it being limited to the specific set of questions the family court has been asked to answer, and to the particular issues that the court has been asked to decide. The real world, where everything is connected to everything else, stops at the courtroom door; you may already have learned that the system is highly compartmentalized, and that despite the devastatingly-high importance of the matters under discussion before the judge, hearings are actually pretty boring overall. It has to be that way, if the judge – an outsider to your life – is to be able to look at your case with an objective eye and to make a well-informed and just decision. When someone else is giving testimony (yes, including your ex!). You have to sit there and take it. You are sitting at a table next to your lawyer, remembering what you read in that article online about being respectful and attentive. Meanwhile, your lawyer is giving a close ear to what the witness is saying, and is probably taking notes to prepare for cross-examination. This may be the hardest part for you to handle, because you have to sit there and take it. 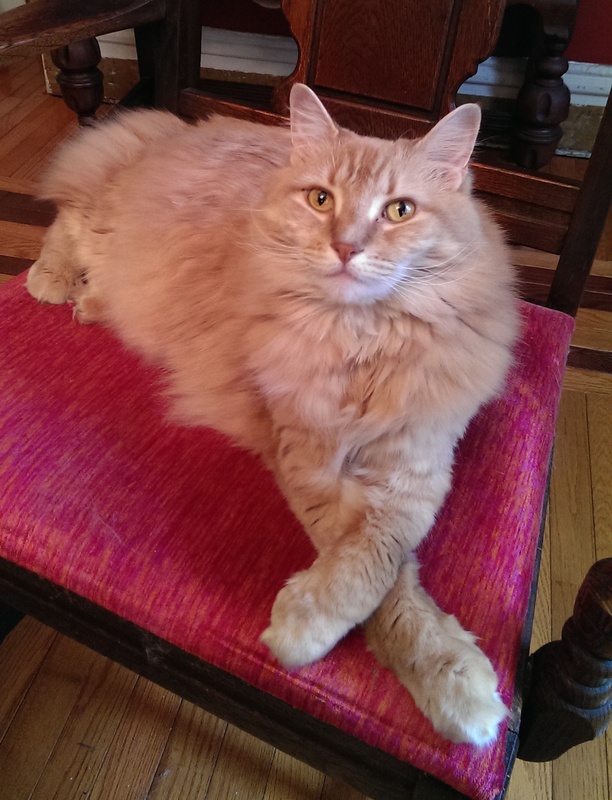 I’m going to say that again, because it matters: you have to sit there and take it. Silently. Calmly. Resist the temptation to interrupt. Words will bubble up into your mouth, aching for release: “That’s not true, Your Honor. Can I tell you what really happened?” Or, “He told me something different before he stole my phone and deleted the texts.” Or, “I never said that!” Or… the list goes on. It’s not your turn to talk, so you have to sit there and take it. Either you have already had your turn, or you are going to have it. Everybody gets to have a say, for good or ill, and with the possible exception of objections (from your lawyer, but never from you!) the judge is going to want to hear it all, without interruption. Communicate with your lawyer. You certainly can (and probably, should) bring problematic testimony to your lawyer’s attention. I always provide my clients with paper and pen for exactly that purpose, so that we can communicate freely. I prefer communicating in writing with a client during trial, because I am listening carefully to what the witness is saying. If you whisper in my ear while that is going on then I’m listening to you instead of to the witness, and that means that I might miss something important. I tell clients that while I cannot guarantee that I will be able to use everything you tell me, I would rather have ten notes from you I don’t need, than miss the one that might have made all the difference. Here we go: it’s time for you to take the witness stand. Take heart and stay focused. It’s time. Your name is called, and you make your way to the “hot seat.” It’s okay to be nervous; usually, that just means that you’re paying attention. If you find yourself getting too nervous, catch your lawyer’s eye and borrow some of his confidence. You brought backup… use it! The courtroom might as well be your lawyer’s satellite office. While your lawyer can never guarantee an outcome, he can certainly promise you at least one cool head in your corner. This is a test you cannot fail. All you have to do is to answer questions, and the only questions you have to answer are the ones you can answer. If you are able to respond at all, the answer might as well be engraved on your bones. This is about the life you have been living day by day: your experiences, your choices, your understandings. This is about your children’s needs. This is about what you earn, or what you own. The truth tells itself. Answer the questions. No matter who is asking you a question, whether it is your lawyer, your ex’s lawyer or the judge, the rule is the same: answer politely and in your own words. Answer truthfully. Answer completely. Answer, and then stop. All you have to do is to answer one question at a time, not to write a book. If more information is needed, another question can be asked. All you need to worry about is answering one question at a time. You are always talking to the judge. No matter who is asking questions, you are always speaking for the benefit of the court. “That’s none of your business” is never the right answer (and yes, this has happened). “Do I have to answer that?” is never the right answer (that has happened, too). Play it straight, speak clearly and audibly, and be sure to pace yourself. Your words are being recorded either by a court reporter or an audio system, and everyone in the courtroom needs to hear and understand what you are saying. The judge may have questions to ask you, too. This is no bad thing, because it means that your judge is interested and engaged, and is taking what you say seriously. Don’t worry about what you think the judge wants to hear, or what he might be looking for. Don’t try to convince the judge of anything. Just consider the question you have been asked, and answer it truthfully. Face the difficult questions head-on. “I don’t know” is a perfectly acceptable answer, if true. “I don’t remember” is equally acceptable, if true. “I don’t understand the question” is fine, as long as you are not playing games. Don’t play games. Don’t split hairs. Listen carefully and be sure to answer the question you were actually asked, and not the one you wish you had been asked. You aren’t running for political office today, so don’t try to evade questions. If the answer you want to give resembles, “I don’t know how to multiply twelve times seventeen, but I can spell Mississippi!” think again before you speak. Your judge has a brain that works just fine, and it’s not hard for anyone to tell when (and why) someone is trying to avoid a question. Don’t be that someone. Don’t worry whether your case is strong enough. That decision is behind you, and it led you to this moment. Win, lose or draw, now is not the time for hesitation or doubt! Now is the time to follow through, like the arrow in flight: the aiming has already been done, the target already has been selected, and all the arrow has to do is to go straight forward. Also, nobody walks into the courtroom with a perfect case, no matter how strong it seems — not you, and not your ex — and the good news is that your case doesn’t have to be perfect. Your judge is trying to decide how best to handle your situation, not to rule on your candidacy for sainthood. This means that you don’t need a halo, just an honest and forthright approach to the questions you are asked. No backtalk to your ex’s lawyer. You are in the midst of what might be a painful or difficult emotional experience today, and you are not going to be at your best. Some lawyers will try to rattle you, scorn you or rile you up enough to make yourself look bad. If your ex’s lawyer thinks he can rattle you into losing your temper or overwhelm you into shutting down, count on it happening. Think of it as bait on a hook, and avoid swallowing it. Don’t try to trade fire for fire with your ex’s attorney, or get into an argument with him, because sometimes the best defense is not a good offense. This isn’t his first rodeo; he’s ready for you to try to strike back, and in no event will bravado impress the judge. Your job today is only to answer questions, and not to ask them. Stay polite. Stay reasonable. Take a breath, take a moment. Your judge isn’t deaf or stupid, and the straighter you play it the less likely you are to be led into trouble in the difficult moments. The judge is the only person in the courtroom whose opinion really matters, so don’t let yourself get rattled into making false statements, or into agreeing with statements you know to be incorrect. You will get through this. Your ex’s divorce lawyer just asked you the question you’ve been dreading. There may indeed be questions that you are dreading, and answers that you are not proud of, but give them anyway. When the answer to a question hurts like hell, remain truthful without flinching. All of us have lived moments and situations that inspire our guilt or shame — especially in the midst of a crumbling relationship — and your lawyer probably can’t protect you from questions that call for relevant information that the court might find useful. Since you can’t change the facts, and since trying to dance around a damaging truth will just make it worse, bite the bullet and play it straight. I present my family law cases “warts and all” because anything else will send the wrong message to the court when the damaging information comes out, anyway. If your lawyer considers it necessary, he can make sure that you get a chance to explain yourself more fully, later on. Meanwhile, take heart from knowing that the judge is not looking for an opportunity to hang somebody from the nearest branch; instead, he is trying to understand the whole situation so that he can offer the fairest and least-destructive solution to the problem placed before him. Your judge has seen it all, probably three times before breakfast, and judges can practically smell it when someone is trying to avoid a question; don’t test him. Check out David Letterman doing it right. Check out former President Clinton doing it wrong. Sit still and make eye contact. Your parents told you that sort of thing when you were a child, and your lawyer is telling it to you now. You don’t have to be made of wood or stone, but overall it is a good idea to keep yourself reasonably still both on and off of the witness stand, and to make eye contact with whomever you are speaking to. When a witness fidgets and avoids people’s eyes while giving testimony, it sends the wrong message to the judge. Treat “Objection!” like a pause button and stop talking. Sometimes, a lawyer will object to a question that you are asked. This is like a “time out” at a sporting event; the game suddenly comes to a halt, and the referees have to talk before the play can resume. When you hear an objection, stop talking and wait for the judge to rule on it. If the objection is sustained you don’t have to answer the question. If it is overruled, go ahead and answer as if nothing had happened. Unless you are representing yourself in court, leave objections to your lawyer and don’t try to make any, yourself. Your testimony needs to be from your own personal knowledge. “Hearsay” is when you are speaking with somebody else’s words: “Joe told me that he saw my wife kissing some guy at a bar,” or “The doctor said that I’m not going to be able to go back to work until after I’ve had surgery.” Ordinarily, “Joe” and “the doctor” would need to be the ones on the witness stand to allow that testimony to be introduced; your own testimony will usually be limited to what you, yourself, have personally seen, heard and done. There are exceptions; you can always testify about what your ex may have said, for example, and you can testify about what you know, and how you know it. When you are on the witness stand, don’t try to be anybody but yourself. Listen carefully, answer truthfully, and sit respectfully. The rest is up to your lawyer, and to the judge. And remember: you will get through this. To a lawyer, surprises are never pleasant! If you need legal assistance with your divorce or child custody case in the greater Pittsburgh area, call our office to set up a personal consultation with a Pittsburgh divorce lawyer and to learn more about Pennsylvania family court affects you. Please do not comment anonymously, and do not post anything that you consider confidential. We try to be responsive to commentary and questions, but know that posting here will not create an attorney/client relationship and that we will not offer legal advice via the Internet.